Hainan cuisine, or Hainanese cuisine, is derived from the cooking styles of the peoples of Hainan Province in China. The food is lighter, less oily, and more mildly seasoned than that of the Chinese mainland. Seafood predominates the menu, as shrimp, crab, and freshwater and ocean fish are widely available. Congee, mantou and baozi are eaten for breakfast, with a noodle dish also being widely eaten. This consists of fine, vermicelli-type noodles with various toppings and gravy. Along with lunch and dinner, late night outdoor barbecue dishes are also served. Dongshan lamb - This dish comes from Wanning. The distinctive taste of mutton is noticeably absent from the dish. The meat, actually goat, is served tender and soft, after being stewed, roasted or braised in coconut milk. Hele crab - Hele crab originated from Hele Town near Wanning, located on the southeastern shores of Hainan. The yellow meat of the crab has an oily texture and a strong aroma. It is usually served with ginger and garlic in vinegar, after being steamed. Jiaji duck - Originating from Qionghai by the Wanquan River, Jiaji duck is made from steamed or boiled duck that was previously force-fed a blend of cereal and bean curd three times daily. Wenchang chicken - This dish, originating in Wenchang, is made from a certain type of free range chicken. The chicken is boiled and then cut into pieces. It is then eaten by dipping the pieces in a mixture of spices, including chopped ginger and salt. The chicken skin is typically yellow, with an oily appearance. Hainanese chicken rice - Also known as Hainan chicken rice, this dish is popular in Southeast Asian countries like Malaysia, Singapore and Thailand. The dish contains the chicken and rice cooked with chicken soup instead of plain water. 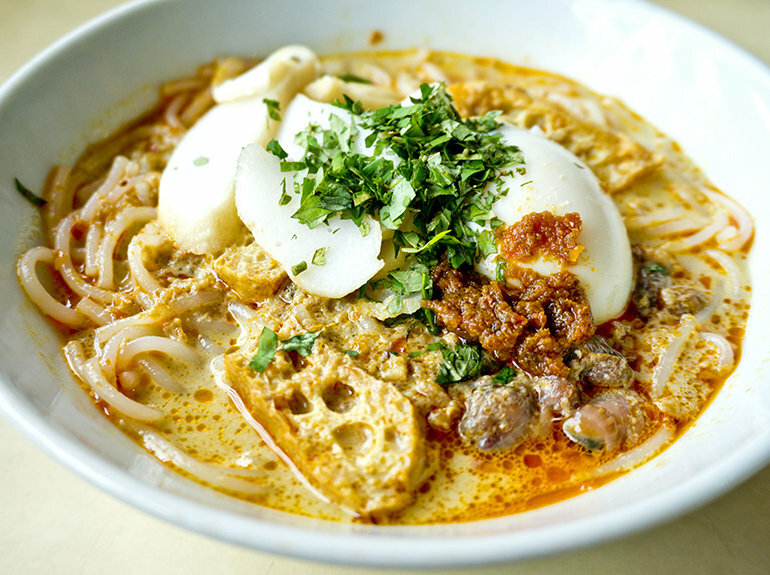 Hainan rice noodles - This dish is common in Hainan. Rice noodles are served at room temperature with various toppings, most commonly tahini and roasted peanuts, or a thick meat gravy with thin strips of bamboo. Hainan-style hot pot - Hainan-style hot pot is normally served in a small wok with a sterno flame underneath. This dish consists of a prepared broth containing pieces of meat. At the time of serving, the meat is not fully cooked. Diners need to wait for approximately 15 minutes before it is ready to eat. Items supplied to be cooked in this type of hot pot include: mushrooms, thin slices of beef, lettuce and other green vegetables. This dish varies in different parts of Hainan. Lingao suckling pork - This dish is from Lingao County. Young pigs weighing approximately 10 kg are either roasted, sauteed, barbecued or steamed. The meat is served when the skin is crisp. Wanquan river carp - This dish is made from one of three species of carp that live in the Wanquan River, known locally as the Xijing, Phoenix Tailed and Quan. It is prepared in a variety of ways, with steaming and stewing being the most popular. Wenquan goose - A hybrid species of goose is used for this dish. They are fattened on a mixture that includes bran and silage.